Block Fire and Ice Book Promos Blog? This will prevent Fire and Ice Book Promos Blog from sending you messages, friend request or from viewing your profile. They will not be notified. Comments on discussion boards from them will be hidden by default. Sign in to Goodreads to learn more about Fire and Ice Book Promos Blog.
" Readers, check out the books that are Free on Amazon this weekend! http://www.fireandicebooktours.com/4-... "
" See what's free this weekend ---> http://www.fireandicebooktours.com/4-... "
" Readers, see the link for a list of books that are free this weekend only! http://www.fireandicebooktours.com/46... "
" Readers, see this post for a list of books that are free this weekend! All genres ---> http://www.fireandicebooktours.com/33... "
A young woman hoping to live the years of America at its height becomes witness to its demise. ...more "
We’d love your help. Let us know what’s wrong with this preview of Hitherto & Thitherto by Ozair Siddiqui. Fire and Ice Book Promos Blog added a status update: Romance readers, see both of these nominations for LR Café’s Best of 2018! We’d love your help. Let us know what’s wrong with this preview of Shenanigans by Gail Koger. 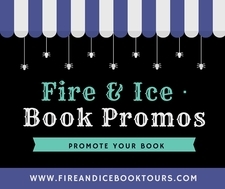 Take a look at Fire and Ice Book Promos Blog’s Year in Books. The good, the bad, the long, the short—it’s all here.